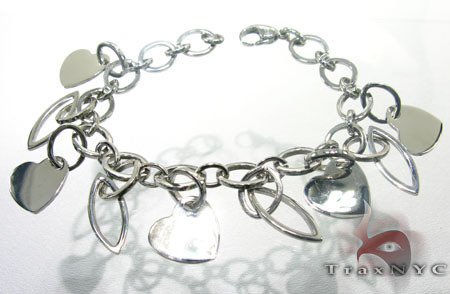 Totally loving this lovely Sterling Silver White Stainless Steel Heart Bracelet I spotted while online shopping at TraxNYC tonight! And after almost 48 hours without sleep and three huge jobs done and delivered in record time, I am ready to pamper myself; starting with something pretty just for me! Now this is what I call a great find. I love the simplicity of this bracelet and it would be perfect to wear on my next coffee session with the girls. Plus it's only $50, which means I won't burn a hole in my pocket and would still have enough to throw in a new pair of earrings! A perfect place to shop for guys as well, I recommend my male readers to visit TraxNYC, the #1 trusted Jewellery Empire online. Here, you can definitely get some fantastic ideas on what to get for that special lady in your life on her birthday, anniversary, engagement or simply to say I Love You. TraxNYC.com also provides high-precision custom jewellery. Using an intricate process, a computer model of your piece is created. Changes can be made to your creation until you are completely satisfied to ensure valued customers like you and me get exactly what we order. This I think is pretty cool. And apparently, TraxNYC has done almost every representation imaginable including the lovable Smurfs , SpongeBob and Bart Simpson too! I can go on and on about all the gorgeous jewellery available at TraxNYC but you have to take a look see yourself to truly appreciate the dazzling delights on display. Some of the items are a little pricey but if you look hard enough, I'm sure you'd be able to find something pretty for yourself too. By the way, all bracelets are steamed and polished before shipment so get ready to sparkle and shine when it arrives! oohhh nice.. i like the bart simpson one.. heheh... shop GP Shop! wah how come no sleep yet.. better sleep after this GP... nanti burn out! It looks amazing~! Enjoy your day Mariuca! oh i like dis heart bracelet!! that Bart Simpson is cute and sparkly indeed. 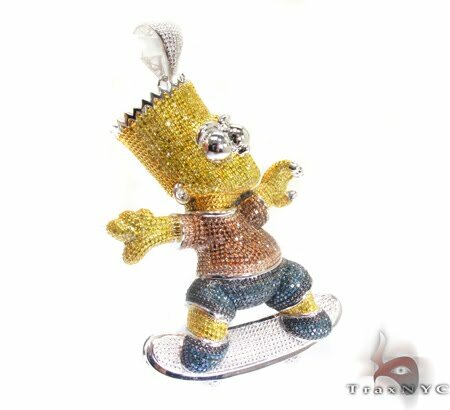 how cool is that bart simpson pendant! It is also very pricey Ayie but yeah oh so cool!